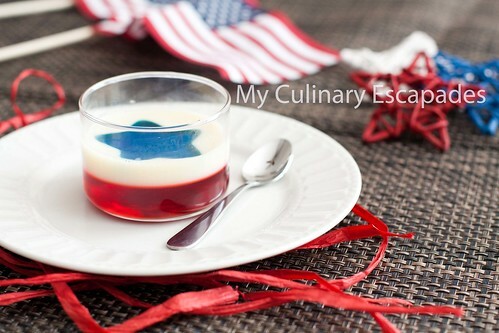 Amaze and dazzle your friends with this patriotic jello which is perfect for Memorial Day or Fourth of July. One of my favorite things to make for guests is jello. People LOVE it. They are always amazed at it and it is super easy to make. While this recipe takes time to allow different layers to set up it is very easy when you are doing it. Don’t worry if you don’t have individual dishes like I do you can make it in a 13X9 pan as well with similar results. I promise you that the time spent on this will be worth it. Mix the red jello with 2 1/2 cups boiling water until dissolved and set aside to allow it to cool a little. If you are doing this in Mini Dessert Bowls pour 1/2 cup into each and place on a cookie sheet and put in the fridge to firm up. Using a cookie sheet will help you get all the dishes in and out of the fridge easily. If you are doing this in a 13X9 pan pour the red jello on the bottom and place in the fridge for at least 2 hours. While these layers are chilling in the fridge make the white jello. Combine 2 packages Knox gelatin and 1 cup boiling water until gelatin is completely dissolved. Whisk in 1 can of sweetened condensed milk until well incorporated. Add another cup of warm water to the mixture and set on the counter to cool. This needs to be room temperature or else you will melt the other layers as you are trying to put it together. 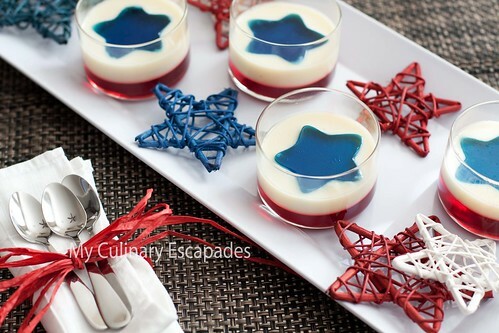 Once the blue jello is firm use a small star cookie cutter to cut blue stars. I used the largest star from this set to make mine. You are going to have leftover blue jello. At my house this jello doesn’t last long, my four kids see me making jello and rush in to find the extra pieces I won’t be using. If you don’t have kids just put it in a dish to eat later. Take the red jello out from the fridge and place one star in each dish. If you are using a large pan place stars intermittently over the surface of the red jello. Using a turkey baster gently get some white jello and pour around the star. At this point you only want to fill the dish to the half point on the star. Refrigerate for a half hour. At this point the white jello should be gently set. Using the turkey baster again gently fill the dish up to the top of the star. Any leftover jello can be combined in an extra dish and consumed at a later date. This recipe makes 12 mini dessert bowls.